I sometimes find interesting events on Eventbrite, this Brunch with Benefits last Saturday, hosted by Meccanica by Cressey, was one of them. It was like an open house with some food. Each floor had a component of the brunch. Ground floor, we registered and received a card to get stamps at each floor. On the 2nd floor, we wet our tongues with a mimosa while we toured the 1-bedroom suite. 3rd floor had a choice of baked goods and the 2-bedroom suite. The suites were very nice - real hard wood flooring! The 7th floor communal garden had the main "brunch" - we munched on fruits and received a choice of bacon & egg or ham & egg English muffin. Then we went up to the rooftop to see the view. Lastly, we went down to the ground level and looked at the artwork on display in the Revolving Door presentation centre. Cressy Group is trying to promote this space in order to cultivate a deeper sense of community in the area. It is a space where artists and community members can showcase there work or host events. Each event also raises money for the Revolving Door resident’s charity of choice thanks to Handybook. See what events are happening here: http://www.cressey.com/meccanica/revolvingdoor-yvr/. A 10-day art and environmental education happening, featuring the world-top conservation themed art exhibit and sale with leading nature and wildlife artists and naturalists. The opening gala for the fourth annual Artists for Conservation Festival will draw both art lovers and nature enthusiasts to Grouse Mountain. This year’s festival focuses on bears. Tickets for the opening gala on Friday, September 26 and Wine & Cheese on Saturday, September 27 are available online. The festival opens to public at 10am on Saturday, September 27 and runs until Sunday, October 5 on Grouse Mountain. A special family weekend is planned for Saturday, October 4 through Sunday, October 5. Culture Days is a national 3-day annual occurrence that celebrates arts and culture. It features free, hands-on, interactive activities and “behind the scenes” experiences where you can get up close and discover a world of artists, creators, historians, architects, curators and designers. Interior Design Show West showcases the best in interior design from Vancouver, North America, and the world. IDSwest is a sophisticated celebration of contemporary interior design, blending hundreds of world class exhibits, collaborative features and presentations by your favourite design icons. $20 includes entrance fee to the Conservatory Meet at Entrance to Bloedel Conservatory All Proceeds benefit Heritage Vancouver Society and the Bloedel Committee, VanDusen Botanical Garden Association. Heritage Vancouver Society and the VanDusen Botanical Garden Association invite you to join Park Board Commissioner, John Coupar and VanDusen Botanical Garden Governor, Vicky Earle for a tour of the Conservatory and Gardens at Queen Elizabeth Park. Find out about the history of the park and conservatory, the techniques being used to restore the roof and life of the plants and birds that call Bloedel home. Allow time after the tour for a leisurely stroll through the conservatory and the gardens. On September 27th, from 10am-5pm, Etsy Vancouver in collaboration with the Emily Carr Etsy Team will be hosting the Vancouver edition of the Etsy 'Made in Canada marketplace' at the ice rink in Robson Square, downtown Vancouver! In this first ever nation-wide Etsy pop-up market, we will be showcasing Vancouver's most talented artisans, artists and makers. Come and support your local handmade community! To celebrate Culture Days in Canada, Tourism Richmond will be hosting its Third Annual Pie Baking Competition (commercial kitchens only) as part of an annual celebration of the Visitor Centre located in the Steveston Museum and Post Office. After judging enjoy a slice of pie and a cup of coffee provided by Steveston Coffee Company with a minimum $2.00 donation with all proceeds going towards the Tourism Richmond Endowment Fund. Meccanica by Cressey is a collection of the coolest condos that you absolutely need to see. But don't take our word for it, construction has finished so come see for yourself. Join us for a different kind of Open House on Saturday, September 27th: BRUNCH WITH BENEFITS. Come on out from 12 - 3 PM on Saturday, September 27th to enjoy the benefits (or until the deliciousness runs out): Beats by Local DJs Sparkling beverages in decorated showhomes Rooftop brunch with a view Hourly prize draws Bike valet by charity donation Free underground parking All donations benefit the awesome charities chosen by the Residents of Revolving Door. MetamorFest is an annual community festival hosted by the Mount Pleasant Neighbourhood House. This fun-filled day includes great live music, an interactive art walk, workshops, booths, and many activities for children, seniors, and everyone in between. It is a great event for people of all ages and backgrounds! With a focus on arts and culture, we are celebrating the diversity of the Mount Pleasant community and providing its members with opportunities to learn and grow. The event also includes a Silent Auction, which is a special way to contribute to the continual hosting of this event. There are great prizes from businesses from all over Vancouver! Join us in the celebration and enjoy great food, music, and fun! Please join Danielle Walker for a book signing for her new book, Meals Made Simple! Note that both of books, Against All Grain and Meals Made Simple will be on-hand for purchase. Hawkers Market returns September 27th with Loud Music by BESTiE, Claire Morifee and Ashar Kazi ! Stay tuned for loads of details to come! FOOD IS THE NEW ROCK #hawkersmarket #BESTiE MUSIC LINEUP! DJ CITO - DJ SETS - 4pm - 9pm Claire Mortifee - 9pm - 10pm Mausiki - 10pm - 11pm BESTiE 11pm - Midnight! It’s Vancouver’s first Slow Fish Mystery Chefs Dinner. Presented by the Chefs’ Table Society of British Columbia and set to raise awareness about a Slow Food initiative called Slow Fish, on September 27 join eight surprise chefs, who will each cook in one of Pacific Institute of Culinary Arts’ professional kitchens, and prepare delicious dishes focused around a unique local, sustainable seafood ingredient. A great event to enjoy local beverages, taste new flavours, meet chefs and socialize while learning about sustainable seafood. Made From Scratch is a new local space by Hawkers Market, focusing on a family style event with Food Workshops, Folk Music, Kid Friendly entertainment, Food Trucks, Long Table Dining and Craft Beer by 33 Acres. Come join our Go Solar Tours this summer to learn how to: -Identify different types of solar panels -Determine the costs and savings of Installing a solar panel -Make your home/building solar ready -Integrate solar energy Into a building -Move away from fossil fuels and into renewables. 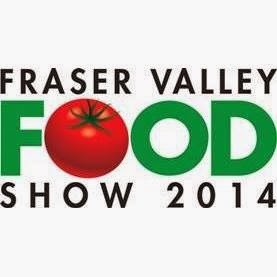 Discover sausages, beer, Top Chefs and gluten free living at the 7th annual Fraser Valley Food Show on Friday, October 3th to Sunday, October 5th, 2014! The Fraser Valley Food Show is showcasing the magic of food and cooking at the Tradex Exhibition Centre in Abbotsford, BC. Experience food both local and international, celebrity chef demonstrations, cooking competitions, sausage making competitions, cheese and wine seminars, Bite of the Valley participating restaurants and the Grapes and Hops wine/beer/spirits tasting pavilion. Butcher’s Showcase Stage, presented by BC Pork and Passion for Pork. Butchers from all over B.C. will demonstrate the art of meat cutting, sausage making, knife skills, and more. Presentations will take place throughout the weekend. Great Canadian Sausage Making Competition - The 3rd Great Canadian Sausage Making Competition takes centre stage at the Fraser Valley Food Show again on October 4th. Dozens of professional sausage makers from all over the province will have over a hundred sausage entries in a dozen categories ranging from chorizo to bratwurst. Gluten Free Living Show - The 2nd Gluten Free Living Show within the 7th annual Fraser Valley Food Show is presented by Nature's Path Foods. Candice Macalino of Nature's Path and Adam Hart, author of The Power of Food, will present their winning gluten-free recipes on the Gusto TV Celebrity Cooking Stage. Show will highlight gluten-free products from manufacturers and a wide range of food producers. Guests can discover, taste, learn from, and buy these hard-to-find items. Gusto TV Celebrity Cooking Stage - Meet Lower Mainland’s favourite food personalities including Chef Ned Bell Executive Chef of Four Seasons Hotel Vancouver, including YEW seafood + bar! The Bite of the Valley - Taste menu selections from some of the Lower Mainland’s favourite restaurants for $1 to $6.00 per portion. 2014 participants include: An Indian Affair Restaurant, Old Country Pierogi (Food Truck), Poomba's Smokehouse (Food Truck) and Over The Top turkey (Food Truck). Fraser Valley Food Show has generously offered my readers a chance to win 2 tickets to the show! Giveway ends on Sunday, Sept 28 at 11:59pm. The tickets will be held for the winner to pick up at the Tradex Centre. Good luck! Broadway Across Canada is bringing FLASHDANCE-THE MUSICAL to Vancouver in November! The pop culture phenomenon of FLASHDANCE is now live on stage. With electrifying dance at its core, FLASHDANCE-THE MUSICAL tells the inspiring and unforgettable story of Alex Owens, a Pittsburgh steel mill welder by day and a bar dancer by night with dreams of one day becoming a professional performer. When romance with her steel mill boss threatens to complicate her ambitions, Alex learns the meaning of love and its power to fuel the pursuit of her dream. FLASHDANCE-THE MUSICAL features a score that includes the biggest hit songs from the movie, including the Academy Award-winning title song "Flashdance - What a Feeling," "Maniac," "Gloria," "Manhunt," and "I Love Rock & Roll." In addition to these hits, 16 brand new songs have been written for the musical with music by Robbie Roth and lyrics by Robert Cary and Roth. FLASHDANCE-THE MUSICAL features a book by Tom Hedley (co-writer of the original screenplay), and Robert Cary with direction and choreography by Sergio Trujillo (Jersey Boys, Memphis). PLEASE NOTE THE TICKETMASTER LINK WILL NOT BE ACTIVE UNTIL 10AM FRIDAY, SEPTEMBER 19! This presale offer is available for one day only so take advantage of it while you can to get the best seats!